Looop supports different types of video content. You can use existing videos hosted on YouTube, or you can upload your own video content to Looop. 2. Enter the full URL of your YouTube video and hit Save. Only public videos can be used in Looop. Note that only public videos on Youtube can be used in Looop. You can also use Looop to host your own video content. 2. 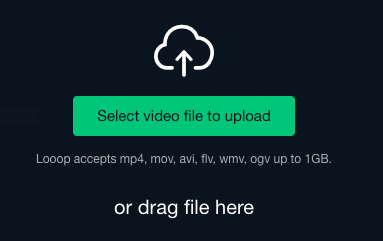 When uploading your video, keep in mind Looop supports files of mp4, mov, avi, flv, wmv, ogv up to 1GB. Depending on the size of the file and your internet, this may take a little while. Note: Do not navigate away from the page while your video is uploading.